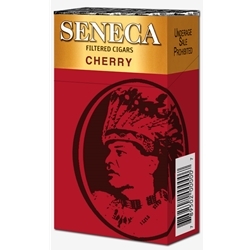 Seneca Cherry Filtered Cigars are available in Box 100's and packaged 20 cigars per pack, 10 packs to a carton for a total of 200 premium filtered cigars. Each Seneca Sweets are filtered cigars created with a “sweet” paper tip made of all natural native tobacco giving you the smooth, rich, natural flavor and the satisfaction you're looking for. Call Smokers Discounts for information about this great cigar brand!